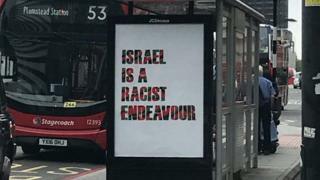 Labour's John McDonnell has condemned posters that have appeared in London saying: "Israel is a racist endeavour." The posters emerged after Labour adopted the International Holocaust Remembrance Alliance definition and examples of anti-Semitism following a drawn-out party row. The IHRA says "claiming the existence of a state of Israel is a racist endeavour" is anti-Semitic. The police say they are investigating "reports of fly-posting". Mr McDonnell, the shadow chancellor, told the BBC's Politics Live the posters, which have been seen in locations including Westminster and Waterloo, should be taken down, adding: "It is not the right thing to say. "It is against the examples that we set out and linked to the IHRA definitions." A spokesman for Transport for London said: "These adverts are absolutely not authorised by TfL or our advertising partner. "It is fly-posting and therefore an act of vandalism, which we take extremely seriously. "We have instructed our contractors to remove any of these posters found on our network immediately." Labour agreed to changed its code of conduct to incorporate all of the IHRA wording at a meeting of its ruling executive on Tuesday, alongside a separate statement that "this will not in any way undermine freedom of expression on Israel or the rights of Palestinians". Party leader Jeremy Corbyn proposed an extra statement that would have allowed criticism of the foundation of the state of Israel as racist but this was not adopted by the committee.